Known as the 'Cambridge Spies', Guy Burgess, Anthony Blunt, John Cairncross, Donald Maclean and Harold 'Kim' Philby were British members of a KGB spy ring that penetrated the intelligence system of the UK and passed vital information to the Soviets during World War Two and the early stages of the Cold War. Guy Burgess, an old Etonian, and a brilliant Cambridge historian, had worked for the BBC as an assistant Talks producer since the beginning of 1937. The Talks Department was then the largest broadcast department: its modern counterpart would probably cover the responsibilities exercised by current affairs and radio features, science programmes, consumer affairs and other programmes. One of the programmes on which Burgess worked was called The Past Week. The speaker was the former diplomat, author, and National Labour MP, Harold Nicolson. Nicolson and Burgess were close friends. The programme was broadcast each week and was one in which he gave his personal perspective on the previous week's events. During late summer 1938 the Foreign Office actively censored Nicolson's talks: they received advanced copies of his scripts, made comments about what could and could not be said, and demanded re-writes or deletions where they thought fit. The BBC was obliged to accept them. The Foreign Office officials could draw on the support of the Foreign Secretary, Lord Halifax, if there was trouble. While Nicolson may have been sympathetic to his former colleagues, he was staunchly opposed to appeasement and thought that Britain should stand up to Hitler; and he was incensed. He was an active opponent of appeasement and participated in discussions with other anti-appeasement MPs such as Winston Churchill, then a back-bencher, former Foreign Secretary Anthony Eden, Harold Macmillan, Robert Boothby. All of them were opposed, but all were finding gaining media exposure to voice their opposition extremely difficult. Churchill, in particular, considered himself effectively muzzled; and was kept away from the radio. Nicolson himself at the height of the crisis in late September recorded a statement for a cinema newsreel, British Paramount News, in which he argued that Britain should stand up to Hitler. The film, which Jeff Hulbert discovered in ITN's archive in 2002, was never shown to any audience until nearly 70 years later. It was this experience, which Burgess witnessed first-hand while working with his friend Nicolson, that helped fire his anger about Chamberlain's ultimate surrender to Germany. But it was also the fact that Burgess had been a KGB agent since the middle 1930s that also stoked the fire: a powerful Germany would in the future inevitable clash with Stalin's Soviet Union and the outcome was too close to call for Stalin's supporters to be complacent. While the Munich crisis was playing out Burgess was also putting together plans for a series to be called The Mediterranean. It would cover the area's history and look at contemporary prospects for peace, given Mussolini's Italian expansionist foreign policies. Churchill had agreed to present one of the programmes, but in the light of the Munich developments had effectively pulled out. On Saturday 1st October, the day after Neville Chamberlain had arrived back in London after signing the Munich Agreement and waving a piece of paper in which he declared 'Peace for our time!' 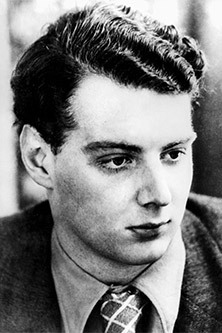 Guy Burgess drove his Ford V8 Pilot off to Chartwell, Churchill's home at Westerham, Kent, to see if he could persuade him not to back out of the programme. In late 1949 Guy Burgess, by then a junior diplomat employed by the Foreign Office, and increasingly alcoholic, committed two grave breaches of security. While recovering from a fractured skull, an injury that he had sustained after being pushed down a flight of stairs by a fellow diplomat during a drunken argument, self-medicating as well as drinking heavily, he was overheard talking about security matters while on holiday in Gibraltar and Tunisia. Called to London he was told he was disciplined and given one last chance to make amends. It was now 1950 and he was packed off to the British Embassy in Washington, where he would be kept under close observation. While there Burgess drank heavily and caused his host (and fellow KGB spy) Kim Philby considerable embarrassment. Philby was there under diplomatic cover, but was the MI6 liaison officer with the CIA and FBI. At some time in the late 1940s Philby became aware that a mutual friend of his and Burgess's, the British diplomat Donald Maclean, was under great suspicion of working for the KGB. 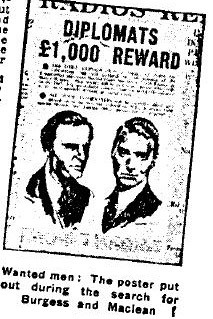 Burgess was told to go to London to warn Maclean to disappear before he was arrested. It was now April 1951. The question was how? Some commentators believe that Burgess deliberately staged his departure so that he would be sent home straight away. Whether he did, or whether he didn't, the facts show that he went on a drink-driving binge in Virginia, was arrested three times and when the State Governor complained to the British Ambassador, Sir Oliver Franks, he was sent home in disgrace. Burgess decided to sail home on the RMS Queen Mary. Two weeks after his carpeting Burgess travelled to New York, looked up old friends and said his farewells. One of these friends, Norman Luker, had worked with Burgess at the BBC during the Second World War. Luker was now based at the BBC's offices in New York. The night before Burgess was due to sail Luker arranged for Burgess to have dinner and, after hearing Burgess tell the story of his meeting with Churchill at Chartwell, it was suggested that he ought to capture it on tape for posterity as it was a good tale; and Burgess's mimicry embellished it well. So that night - or in the wee hours the following morning - Burgess recorded his story. The next day Burgess hurriedly listened to the audio tape, dropping by while en route to boarding the RMS Queen Mary, decided that there was 'nothing incriminating' on it, and caught the liner. Three weeks later Burgess and fellow diplomat Maclean disappeared; nearly five years later, in February 1956, the pair gave a press conference - their first - in Moscow to a select band of foreign correspondents. After Burgess and Maclean had disappeared MI5 and the FBI scoured both sides of the Atlantic for any facts they could about the missing pair. Known contacts were quickly followed up and this is how the FBI came to learn about the audio tape, which it impounded and in whose sole possession it remained until Jeff Hulbert and Stewart Purvis requested its release under the Freedom of Information Act in March 2013. A copy was supplied to MI5 within months, but a British Freedom of Information Request revealed that the British copy of the audio tape could no longer be found. Burgess left the book that Churchill had presented to him at the apartment occupied by Alan Maclean, Donald's brother, a fellow diplomat and former colleague of Burgess's. Burgess tells exactly where the book was located - even spelling out the address - and it, too, was for a time impounded by the FBI. In 2010 the book was sold by Christie's for £12,500. Stewart Purvis began his career as one of the BBC's first news trainees, going on to become Editor-in-Chief of Channel 4 News and, ultimately, Chief Executive of ITN. In 2003 he became City, University of London's first Professor of Television Journalism and a Visiting Professor of Broadcast Media at Oxford University. In 2000 he received the CBE for services to broadcasting and in 2009 he was awarded the Royal Television Society Gold Medal for an outstanding contribution to television. Jeff Hulbert is a media historian who initially specialised in cinema newsreels and television news, but has become increasingly interested in the ways in which the media and political worlds collide. He has managed two publicly funded film and television history projects and is currently an Honorary Research Fellow in the Department of Journalism at City, University of London.